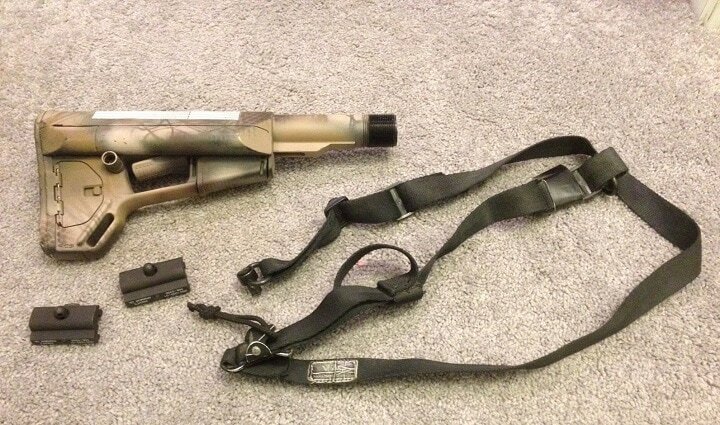 If you can only make one upgrade to your AR 15, shotgun, or any other long gun it should be a sling. Right behind iron sights, a sling is an essential piece of gear. 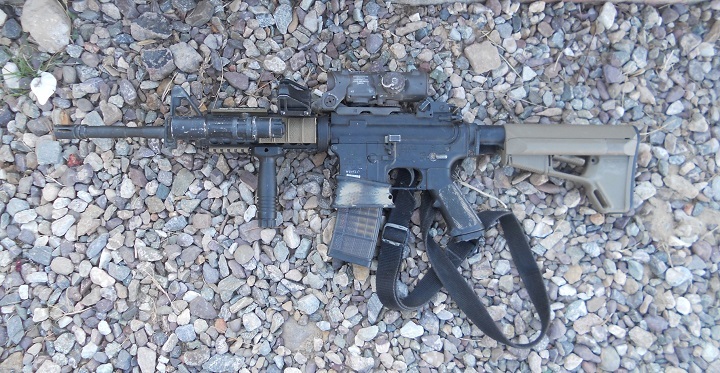 Slings have been used since rifles were issued and for a good reason. First and foremost it makes carrying your weapon incredibly convenient and easy to do. 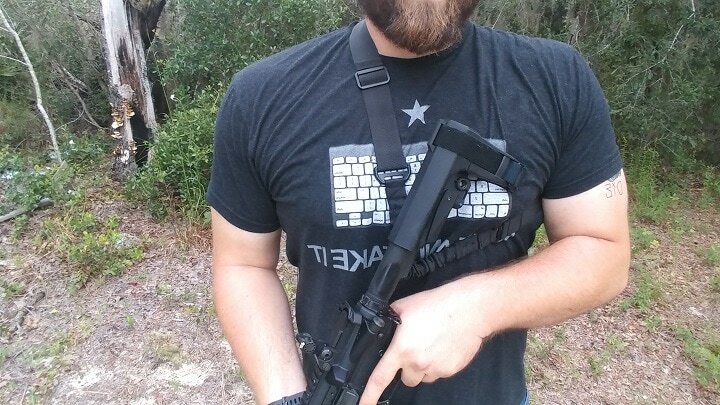 A sling allows you to carry your rifle over your shoulder or across your body. It supports the weapon, which reduces fatigue over the long haul. 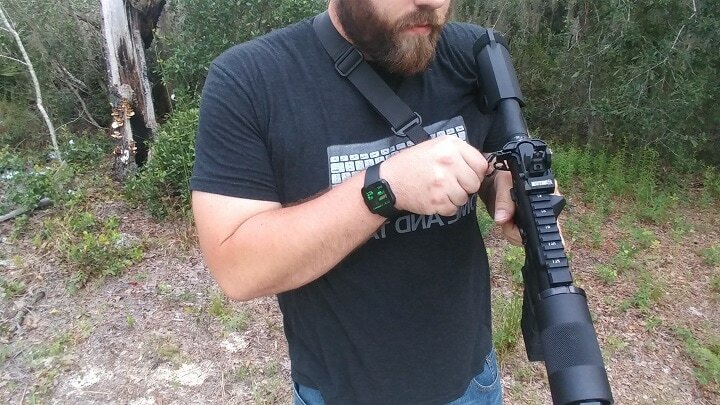 A sling also gives you the ability to use your hands and carry your rifle at the same time. If you come to a task that requires both hands, you can let your rifle hang on the sling and complete the task. This could be climbing over an obstacle, carrying a casualty, providing first aid, or just picking something up. A sling lets you do all that. Another major reason you have to have a sling is for weapon retention. If someone grabs you or your gun and tries to take it from you, they’ll have a real hard time doing so. Keeping it slung to your body will make it almost impossible to rip from you. Another danger is something as simple as slipping and falling. You could lose your gun and have it slipping and sliding as you fall. In some situations, this is a pain, in others it's dangerous and risks you losing your gun. A sling is a must-have accessory, and you’d be hard pressed to find a reason not to have one. There are a number of factors to consider when choosing a sling, some focus on comfort and others on purpose and use. Finding a good sling isn't too hard these days, and the real key to success is finding a quality model that fits your purpose. Here are a few factors to consider when choosing a sling. The general rule of thumb is the more substantial the weapon, the wider the sling you’ll need. The wider the sling, the more the weight will be evenly distributed. This reduces fatigue and helps cut the feeling of the sling really digging into you. Slings designed for heavy guns will usually feature a large pad that can be placed over the shoulder and fitted for comfort. This is a must-have for those heavier AR 15s, AR 10s, and shotguns. This pad makes a lot more sense after carrying your gun more than six hours. As a machine gunner, I toted a gun that weighed nearly 30 pounds, and the sling I used had a large pad. It made a significant difference to my back and shoulders, and my deployment to Afghanistan would have been a lot different without it. Comfort matters. If you are focused on that pain in your shoulder, you aren’t paying attention to the world around you, and therefore you are putting yourself at risk. How does the design effect using the sling? Is it easy to make adjustments? Is it easy to attach sling mounting hardware? These are questions you need to ask before purchasing and using a sling. The sling's design will allow you to incorporate the sling with your weapon successfully. If it has HK clips for example and you had QD slots you may want to consider different hardware. If you need to adjust the sling for use with and without body armor, you’ll want something with plenty of adjustment range and preferably something quick and easy to adjust. The overall design should be simple. Anything too complicated and mechanical is likely to gum up the works and break a bit easier. You’ll also need to consider sizing the sling for your body type and gear. As a big guy, some slings are too tight, especially when you are wearing body armor. Most slings will list their adjustment range in inches, and this will give you a solid idea of how long the sling is versus how big you are. What is the task of your weapon? This will help you choose the right sling. A defensive firearm for home protection is a lot different than a rifle designed for hunting. 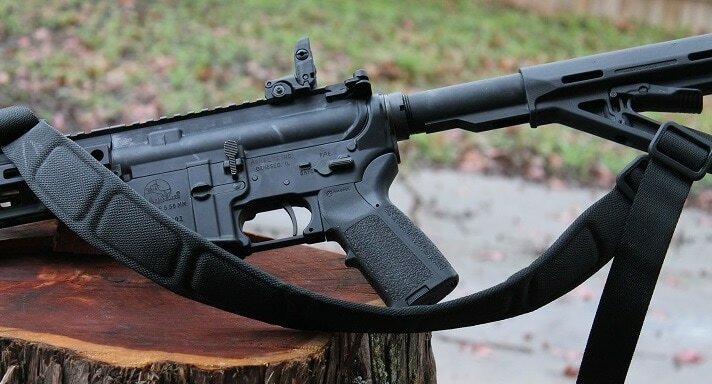 A duty AR 15 will have its own requirements for a sling. I suggest really examining what the weapon is for and determining what the everyday use for that sling will be. Home defense slings need to be rapid to put on and take off, and preferably very strong. These slings can prioritize comfort last since they won't be worn for hours at a time. A hunting rifle sling should prioritize comfort first since the rifle is likely to be carried for extended periods over rough terrain. A sling for a duty grade weapon needs to be comfortable, durable, and adjustable. The two main material used in sling design is leather and a wide variety of different synthetic materials. Leather is still a classic choice due to its durability and strength. Leather slings are also very stylish and have a throwback appearance. Leather slings are best reserved for hunting rifles and shotguns. While they are strong and durable, the material isn't as malleable as synthetic options and doesn't offer the same design influences a tactical sling requires. Another stylish material is paracord. Weaving paracord is a unique and fun way to make a sling, or you can, of course, buy pre-made slings. Paracord is robust, durable and looks cool, but is limited in design and again a better option for a hunting rifle. Materials like ballistic nylon, however, are excellent for tactical slings. This light, but durable material is malleable and works with a variety of designs. Ballistic nylon and similar materials are the way to go for long-term sling use. There are three types of slings out there, and each has its place in the hunting and tactical world. Each design has its good and bad points, and different shooters all have their preferences. I’ll try to do my best to avoid my own personal bias when talking slings. Single point slings attach to a single point on the weapon. This allows for a robust and straightforward type of sling that’s idiot proof. The sling attaches to the rear of the firearm and typically features a loop that goes around the body over one arm and under the other. 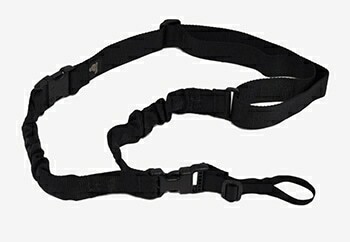 Single point slings are also an excellent choice for tactical shooting and do have some limited hunting applications. Single point slings are very easy to use and allow you to don and remove your sling with minimal effort quickly. The sling always makes it very easy to maneuver the weapon, especially when it comes to indoor use. 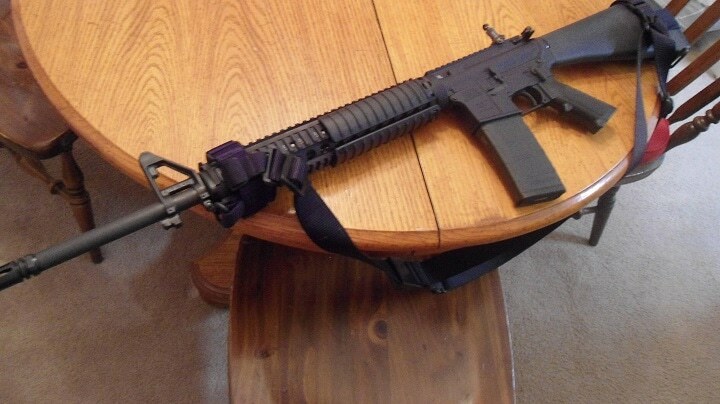 Since the sling only attaches to the rear of the gun, the muzzle is entirely free. Single point slings also allow transitioning from shoulder to shoulder when necessary smoothly. This will enable you to shoot around barriers. The single point sling offers the enormous range of movement for shooters of all three sling types. They are very simple and will not likely get tangled up in your gear as move and groove. When you aren’t handling the weapon, a single point sling does kind of just flop around. For male shooters, this could end in some uncomfortable blows to the downstairs. Single point slings tend to allow your weapon sway and bounce when you don't have total control over the weapon. These slings are the hardest to climb with and do make it difficult to get up and over an obstacle. They will allow your weapon to bounce on and off obstacles. Am I cheating with the Magpul MS3? Maybe. 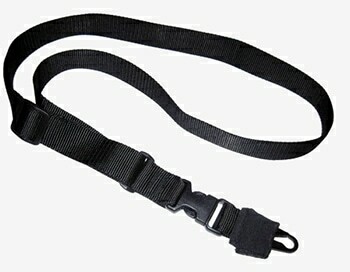 This is a convertible sling that can function as both a two-point or a single point. Since it’s Magpul, I’m sure you guys will let me slide. Magpul has a winning reputation for producing high quality, well-made gear at an affordable price. 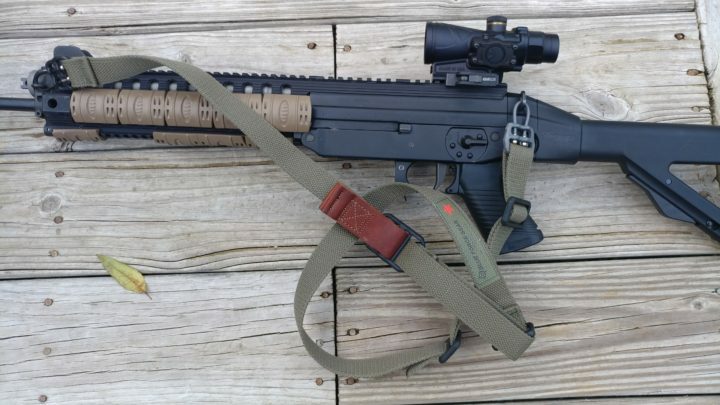 The MS3 sling is a very modern option for the modern tactical shooter. 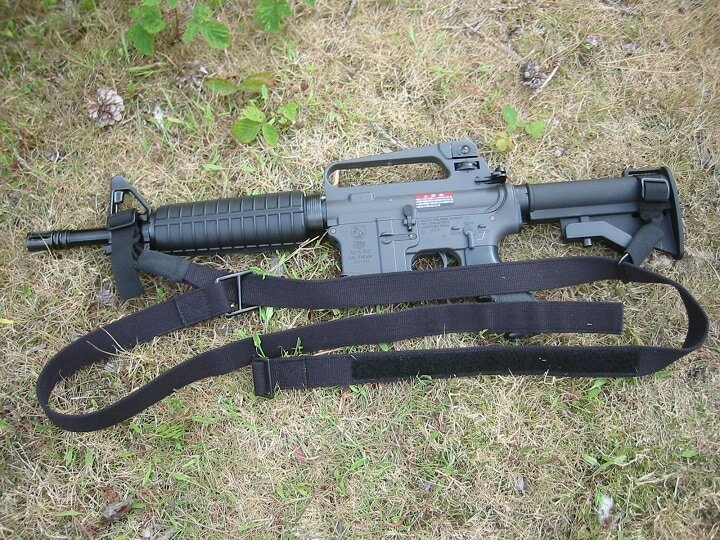 This sling is well suited for modern sporting rifles like the AR 15 as well as the AK series, and MP5s of all types. This flexible and well-made sling is comfortable and easy to convert between a two and one point. The MS3 comes with Magpul QD points for quick attachment to modern weapon mounts. It’s compatible with the Magpul RSA and MSA attachment points as well as loop style sling adapters. This opens it up to a wide variety of different mounting hardware. The MS3 is a professional grade sling and built to last. It will function in the harshest environments and keep kicking as long as you are. This is a modern multi-mission sling ready for patrol, for CQB, and shooting around barriers. Don’t ever say it's not versatile either. This is the most modern option for a one point sling out there. The price of Magpul MS3 varies, so check the latest price at Brownells. Specter Gear and I go a long way back. I used one of their slings for years on my machine gun, and it functioned extremely well. Specter is a bit of a budget brand, but they produce great gear overall. The Viper Sling is a single point sling that incorporates features that make carrying and using this sling a dream. The Viper Sling is made from ballistic nylon but also features two elastic shock cords. These make carrying a AR 15 a dream over rough terrain. Rough terrain makes the weapon which can pull on your neck and back and be uncomfortable. With the elastic cords, it has some give and the rifle drops, but you aren’t pulled with it. The Specter Gear Viper has a big hook on one end that’ll easy attach to your modern AR 15. The Viper Sling also features a nice buckle release system that allows you to keep wearing your sling when you detach your weapon. This makes it easy to operate in and out of vehicles with. The slick has another emergency release at the rear that just allows you to detach the sling and weapon from your body completely. This 1.5-inch wide sling is very supportive and will help carry a heavy weapon very well. It’s great for maneuverability and gives you an outstanding amount of control over the gun. Plus, it’s an affordable option. The price of Specter Gear varies, so check the latest price at Brownells. If you are just looking for something simple and rugged, then the Tac Shield is the sling for you. 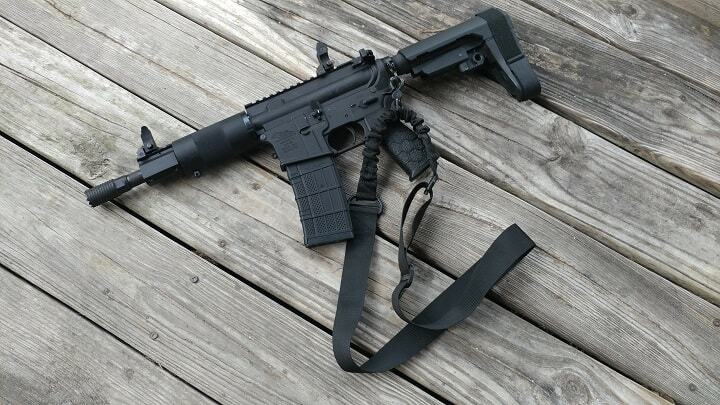 This very affordable sling is designed for the modern rifle but remains simple and reliable. 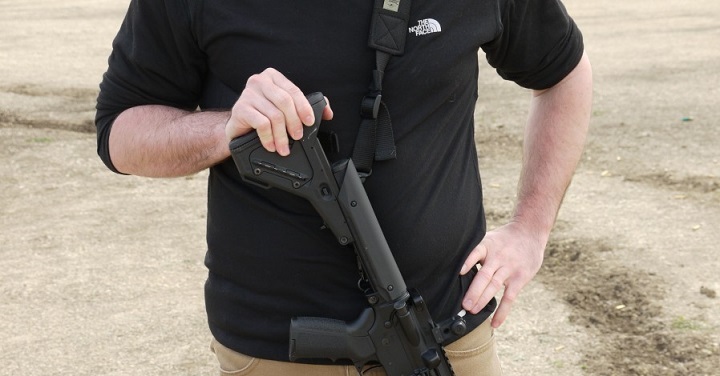 The Tac-Shield CQB sling is best suited for lighter rifles and SMGs. It is a thin and lightweight sling designed to accommodate these smaller guns. It's 1.25-inch wide strap is perfect for PCC’s and similar designs. 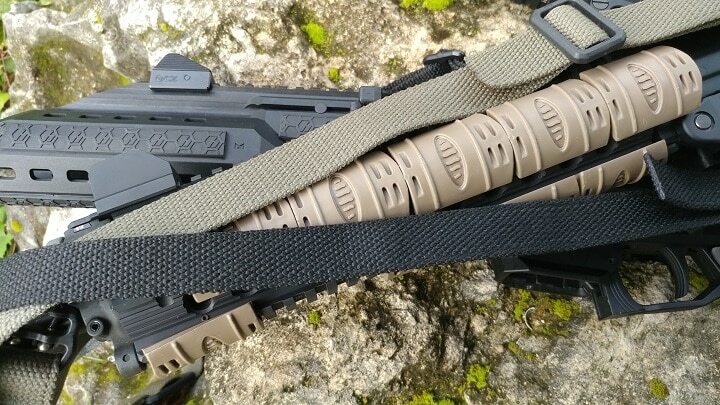 The Tac-Shield CQB sling uses the famous HK hook to hold your gun, and this makes it compatible with most modern rifles. There is a hook silencer over the HK claw which reduces that rattle you get with metal on metal contact. That hook is also connected to a buckle system that makes it very easy to detach the weapon without removing the sling. This, of course, makes movement in small areas easier. You get a lot of freedom with this sling, and it's a design that’s easy to weave through MOLLE webbing for a simple over the shoulder use. This is one of the more affordable, and basic slings, but that doesn't make it a bad choice in any way. Know its limitations, and you'll be more than satisfied with what it can offer you. The price of Tac-Shield CQB varies, so check the latest price at Brownells. Two point slings are the most common sling in existence and have been around forever. 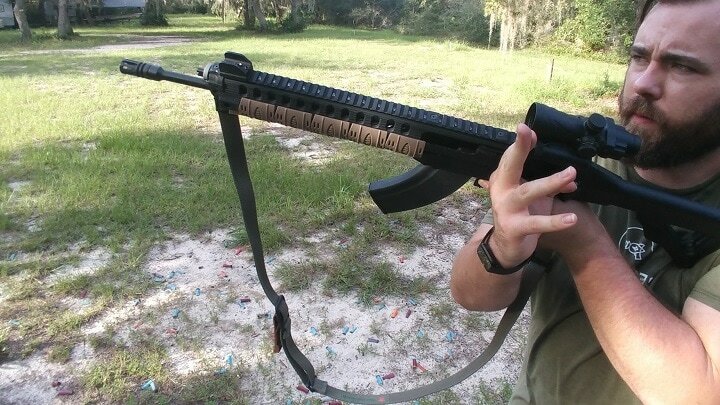 The name comes to the fact the sling attaches to two points on the rifle. These slings vary greatly in design and function. 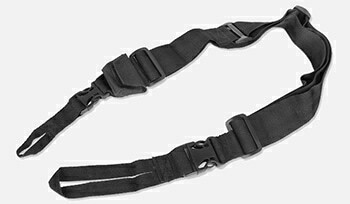 2 point slings are popular for hunting and tactical use. 2 point slings offer a massive amount of support and adjustment. They can keep the weapon from moving and keep it tight to the body when it's not being gripped. Two point slings make it easy to climb over obstacles, carry a deer, or to just let the weapon rest. 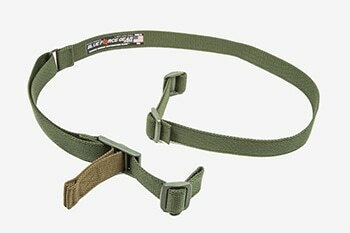 Two point slings are the current go-to of the United States military due to their supportive design. The modern tactical 2 point is nothing like the old school web sling or leather hunting sling. Two point slings will limit your maneuverability to a point. Unlike a one point sling, you do have that forward connection which will cut your freedom of movement slightly. You also can't transition without taking the sling and rifle off your body or wear the sling very loosely. The Blue Force Gear Vickers Combat Application Sling is my favorite sling of all time. It’s the current issue of the USMC and one of the best slings ever made. The Sling was designed by Larry Vickers, a former Delta Force Operator turned firearm instructor. 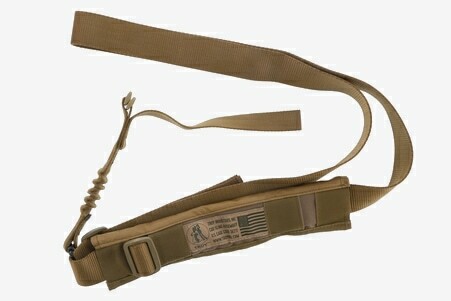 The BFG Vickers sling revitalized the modern two point sling and had become the industry standard the modern tactical sling. 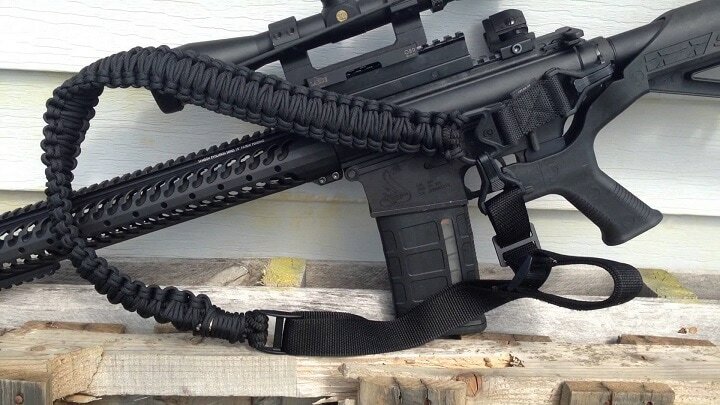 This is an amazing sling for a AR 15, a AR 10, an AK, and many more guns. 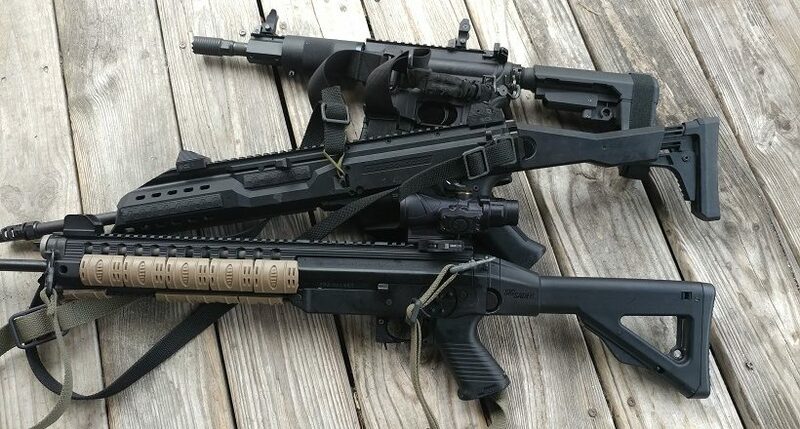 BFG makes a wide variety of different slings for different style guns, including K editions and the Vickers One sling for SMGs. The Vickers Combat Applications Sling beats the standard two-point design by incorporating a pull tab that instantly changes the size of the sling. This pull tab can pull the sling so tight that it's almost flat against the body. In this mode, it is easier to climb, carry things, and traverse hazardous terrain. With another pull of the tab and you’re loosey goosey and ready to rock and roll. This mode will let you rock and roll in a CQB environment essentially free from your rifle’s constraints. The Blue Force Gear Vickers sling works well, is incredibly well made, and BFG produces tons of different attachment hardware to make it mountable to any system. The price of The Vickers Combat varies, so check the latest price at Amazon. If you have a heavy duty rifle that tends to be a bit heavier than most the Viking Tactics Padded sling is for you. This sling is mostly 1.5 inches wide until you get to the shoulder portion. This area is much wider and much thicker. This built-in pad is designed to provide comfort for heavy guns. 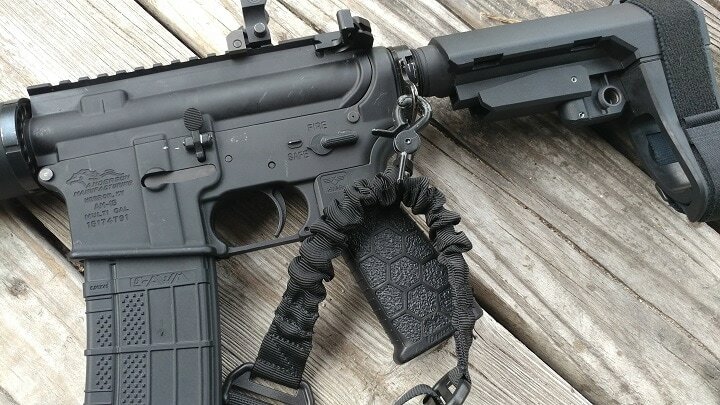 The Viking Tactics Sling is designed by another Delta Force Operator named Kyle Lamb. It’s almost like these Delta guys know a thing or two about gunfighting. The Viking Tactics sling utilizes a quick and easy to use pull tab that’s similar to the Vicker’s design. Pull it, and it tightens, pull it the opposite way and it loosens. 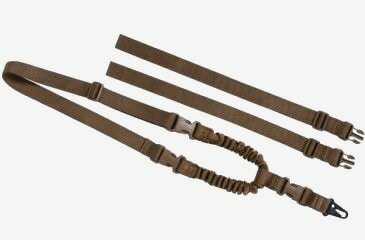 This model is considered the upgraded Viking Tactics sling and the metal hardware and plastic buckles are long gone and replaced with elastic stow bands for greater simplicity. This is another very modern two-point design that has helped the 2 point sling take over as the dominant tactical sling. This design is more friendly toward heavier guns and for very long patrols over the very rough terrain. That little pad will make a major difference when it comes to fatigue and cramping on the arms and back. Fatigue will eventually lead you to shoot worse which could lead to you getting real dead real fast. The price of The Viking Tactics Padded varies, so check the latest price at Amazon. Troy is mainly known for making high-end rifles in a variety of calibers and configurations. Their recent dive into the accessories industry has been well met. The Battle Sling and Battle mags are both proved and reputable AR 15 rifle accessories. The Battle Sling is what we are talking about today. The Battle Sling is a two-point sling that incorporates a wide variety of features to make it one of the best on the market. The Battle Sling offers a wide variety of different features that make it an attractive choice. First it easy very easy to adjust for different lengths. Second, it incorporates a nice thick pad for extended patrol carry and to reduce the drag down feeling of heavy weapons. The sling also has a short elastic cord near the end of the sling. This allows the weapon to bounce and flex when running or moving over rough terrain. This reduces the pull-down effect on the individual carrying it. 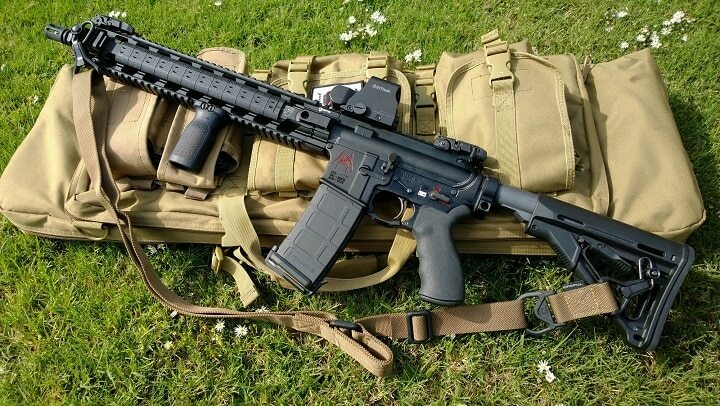 The Troy Industries Battle Sling can also accommodate a wide variety of guns, including the AR 15, AK series, and even heavier weapons like the G3. The Tory Battle Sling is also quite affordable and designed for heavy use. It's an excellent addition to any rifle and comes in a bit cheaper than other similar quality options. The price of Troy Industries Battle varies, so check the latest price at Amazon. Three-point slings are interesting and are a bit of a dying design. 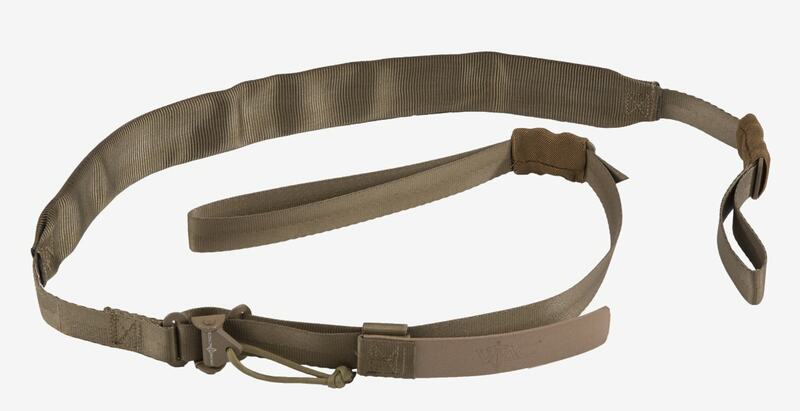 Three-point slings were some of the first real tactical slings, but their popularity is fading. Three-point slings go over your body like a two-point but have an extra loop in the middle. Three-point slings are very supportive slings that are perfect for heavier weapons like AR 10s. Three points offer a lot of control over the weapon, especially if you have to let it hang. 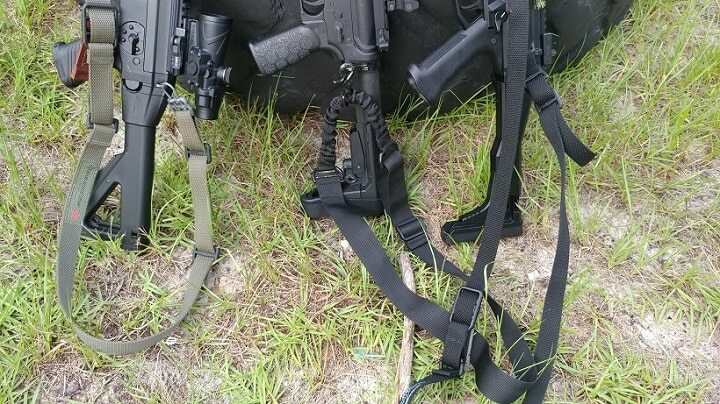 Three-point slings are very easy to use and perfect for full sized rifles. 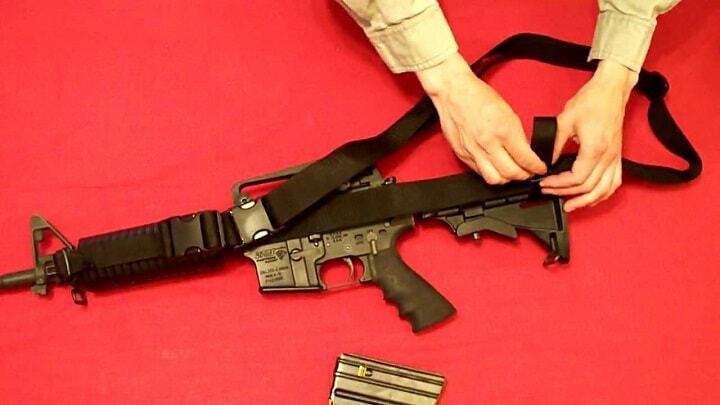 Guns like 20 inch AR 15s are well supported by a three-point sling. Three-point slings are a mess of straps. They can get caught up on your gear very easily. Three-point were designed prior to the heavy use of modern tactical gear, and it shows. Three-point slings can also be an interesting experiment in adjustment with so many different straps forcing you to adjust each one to wear the sling correctly. Specter gear shows it’s face again with one of the most versatile three-point designs out there. If securing the weapon to your body is your goal then Specter has you covered. This particular sling has a multitude of options available for it. This includes three different AR 15 options. 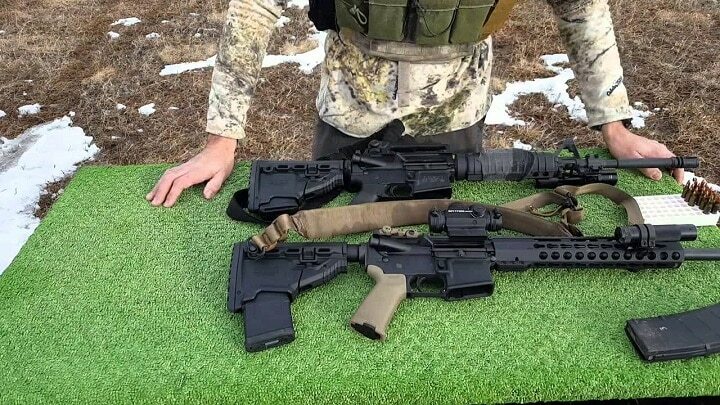 One for full stock A2/A4 style rifles, one for M4 style with rails, and one for M4 style rifles with standard handguards. The last model is for a fully stock Remington 870 12 gauge. The Specter Sling is made from strong and durable nylon designed for heavier weapons. This makes it a very comfortable option for the AR. This sling will let you drop the weapon and go to your sidearm with ease. The Specter 3 Point sling is easily adjustable and can be fitted for ambidextrous use. The 3-point sling is designed for combat use and is incredibly quiet. You can make completely sound free adjustments for comfort and easy adjustment. The Specter Sling will let you keep your gun close at hand at all times, and this results in a very secure means to carry your gun over all types of terrain. 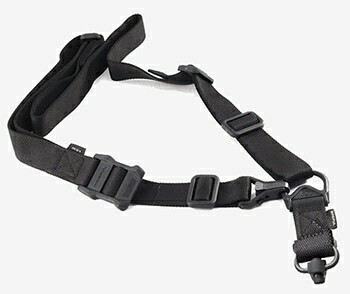 The Specter Sling also has zero unnecessary straps, buckles, or fasteners. This helps fight a common complaint that 3 points are bulky and get in the way. The price of Specter Close Quarters Battle varies, so check the latest price at Brownells. Simple and effective are two ways to describe the Tac-Shield Combat 3 point sling. This model is designed to be universal among the M16 and M4 style rifles. 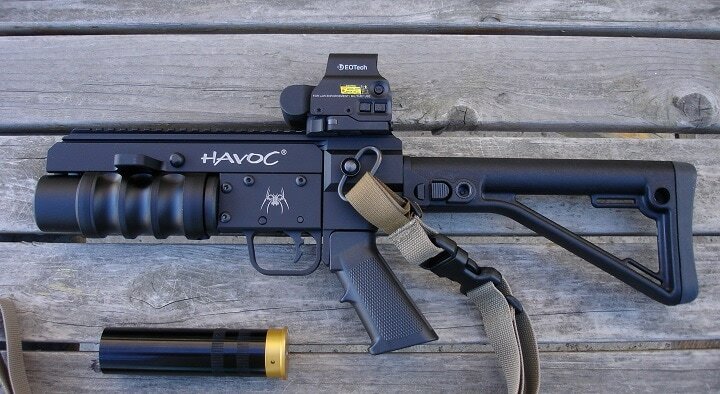 It's perfect for long-range special purpose rifles and close quarters SBRs. One thing that sticks out to me is the emergency release buckle system. Sometimes 3 points can be a hassle to remove when wearing gear. 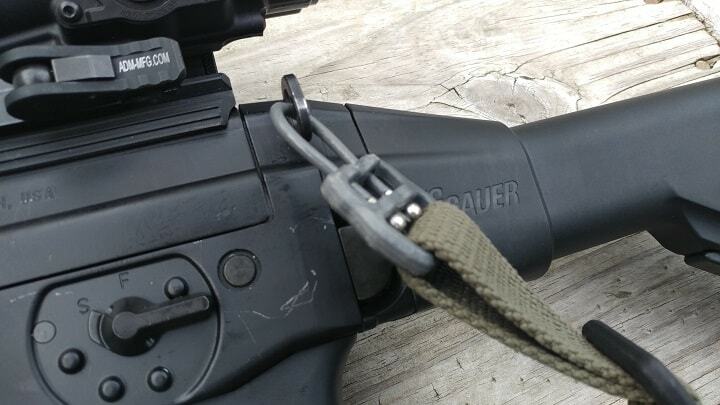 The addition of this buckle prevents that and makes removing the sling very easy to do. This helps the shooter maintain control over their weapon and allows them to unsling safely. The Tac-Shield uses heavy duty 1.5-inch Mil-Spec webbing that ensures strength and helps support those heavier AR style rifles. 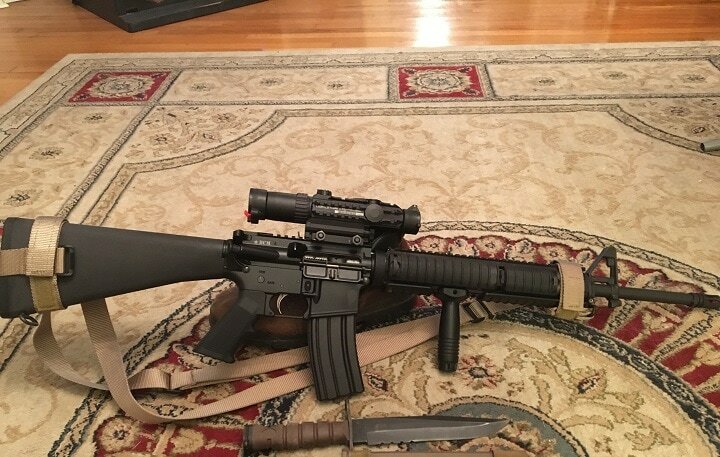 If you start loading an AR down with an optic, a bipod, and full stock it starts to get heavy. The Tac-Shield also has a Fast Adjust Cam lock that lets you move the gun from shoulder to shoulder, this addresses one of the weaknesses with the 3-point setup. The Fast Adjust Cam-lock is silent and perfect for lengthening and shortening the sling. The Tac-Shield is a rock solid platform for shooting and carrying a firearm. It’s maneuverable, modern, and incorporates some unique features that set it apart from the standard 3-point design. The price of Tac-Shield Combat varies, so check the latest price at Brownells. If you need a sling for a heavy weapon, and I mean a heavy weapon, then FAB Defense has you covered. The Fab Defense 3 Point Sling is designed for guns ranging from the M4 carbine style AR 15 up to full sized 7.62 NATO battle rifles like the G3 and FN FAL. It’s a strong design that accommodates big weapons with ease. The FAB Defense Tactical Sling is designed for use with modern rifles and will accommodate a variety of different attachment hardware. The FAB Defense Tactical slings are also near endlessly adjustable, and you can really fit this sling to your body. The nylon weave is tightly woven, and the webbing resists fraying and snagging and will last a good long time. The FAB Defense Tactical Sling can be converted into a 3,2, or even a 1 point design. This makes it modular well past a simple 3 point design. Anything that versatile and adjustable is well worth the cost. The thing is, this isn't an expensive sling. It’s priced to move, and funny enough has a built-in earplug storage pouch that just so happens to accommodate CR123 batteries pretty well. It’s cheap, adjustable, and well suited for everyday use. The price of FAB Defense Tactical varies, so check the latest price at Brownells. 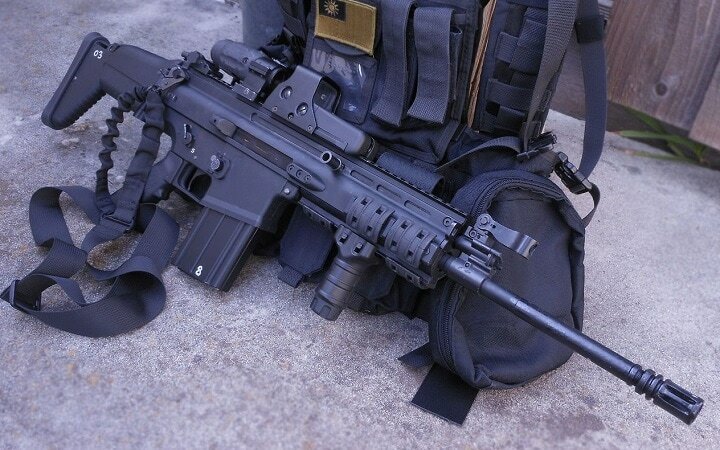 A good sling is a must-have for your tactical weapon. 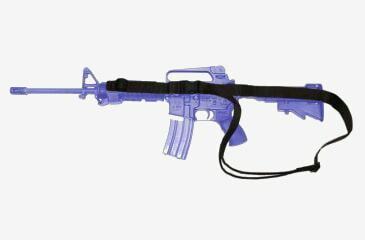 The AR 15, for example, is one of the most common weapons and therefore one of the easiest options to find a sling for. 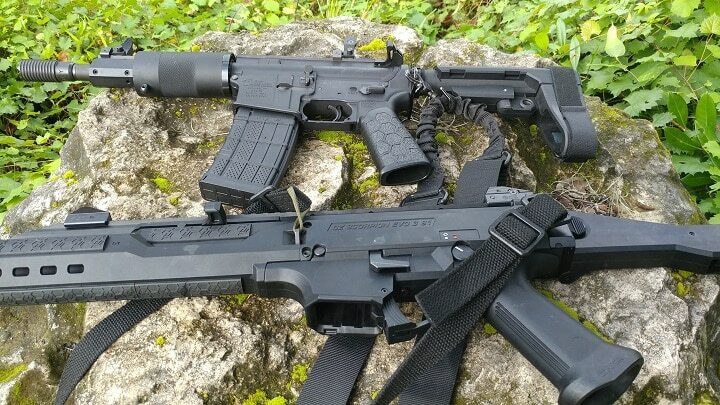 Choosing the right sling is a big choice to make. 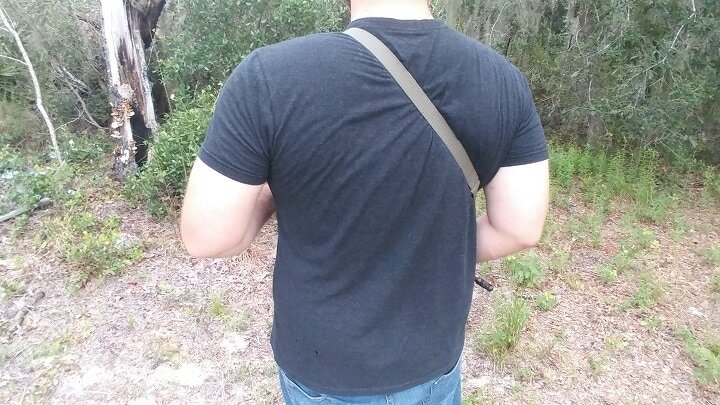 Having a good rifle sling makes a big difference when it comes to the control you have over the weapon. You got to have a sling that lasts, is easy to use, and will satisfy your mission parameters.